Obesity and the USDA’s Food Scheme. Adele Hite, M.A., an advocate for healthy nutrition, presents clear evidence that people who follow the USDA’s untested recommended dietary program, formerly known as the Food Pyramid and now the Food Plate, become obese and have blood sugar problems. However, she reveals that those who regularly eat certain traditional fats, proteins, and vegetables experience weight loss and more energy. Apples and the Economic Impact of Birds. Tony Juniper pens a delightful description of the economic and environmental advantages nature has over the use of toxic chemicals in managing insect infestation in food crops. The Lymph System, Cancer & Removing Cellular Waste. 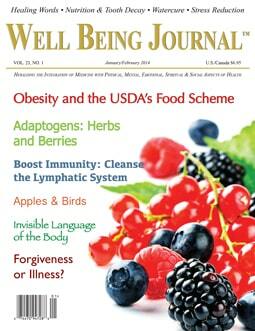 Journalist CJ Puotinen, in this updated article, explains what the lymph system does and how diet, herbal medicines, and exercise such as rebounding can assist it in its role of keeping the powerful immune system healthy. Watercure for a Healthy Body. Russell Mariani, a longtime practitioner of water therapy, writes of his inspiration by F. Batmanghelidj, M.D. to practice proper daily hydration. The watercure steps are simple, and by following them, Mariani rid himself of long standing depression and anxiety. Adaptogens & the Healing Response: From Surviving to Thriving. Donald Yance, Jr., C.N., a registered herbalist, defines adaptogenic herbs as those that have learned to survive and reproduce in nature, thus giving those he discusses in this article stress-ameliorating qualities for a healthier body. Shannon McRae, Ph.D., describes the subtle but powerful effects of forgiveness and offers several cases where clients presented severe illnesses that reversed after they practiced focused forgiveness. The Invisible Language of Our Bodies. Healing with Words, by Michael Samuels, M.D.